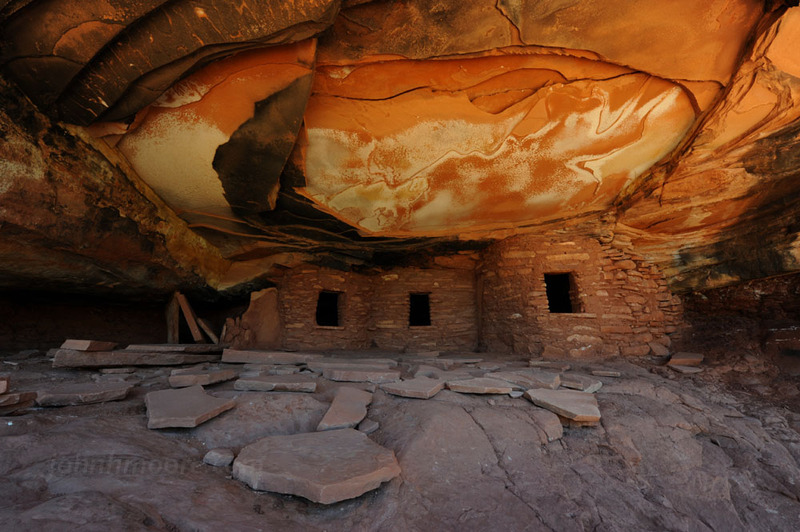 I’ve been fascinated by Anasazi (Ancient Puebloan) ruins for most of my life. 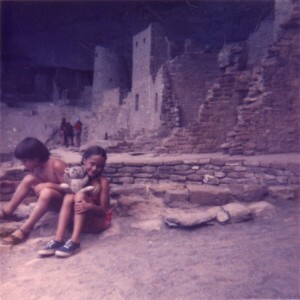 Since childhood, I’ve been carrying around a couple small photos of my sister and me inside of one of the larger cliff dwellings (Cliff Palace in Mesa Verde, Colorado) and went through a phase 10-15 years ago where I read a lot of books about Native Americans of the Southwest United States. Now, as a photographer, I’ve wanted to start visiting some of these places and photographing them. 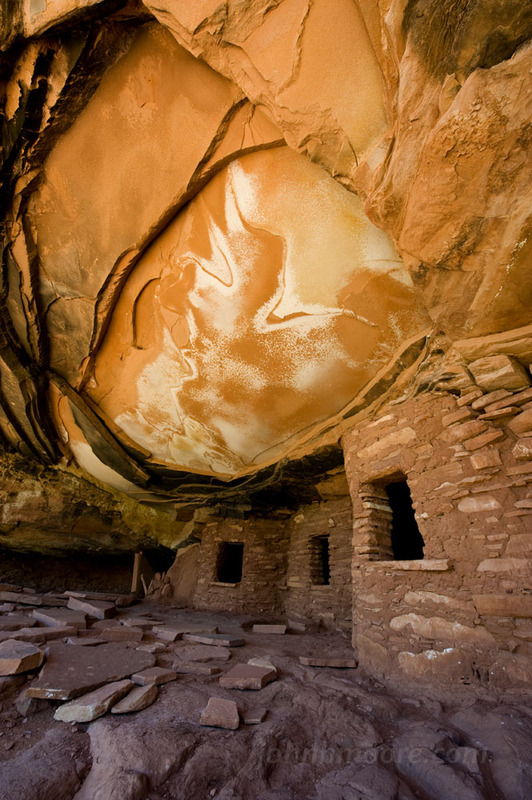 Not being a big fan of tourist throngs, and with an emphasis of photography, two of the ruins that really stand out are House on Fire and Fallen Roof House, both in the Cedar Mesa area of Utah. Each of these is a stunning location, and neither is set up as a tourist destination. 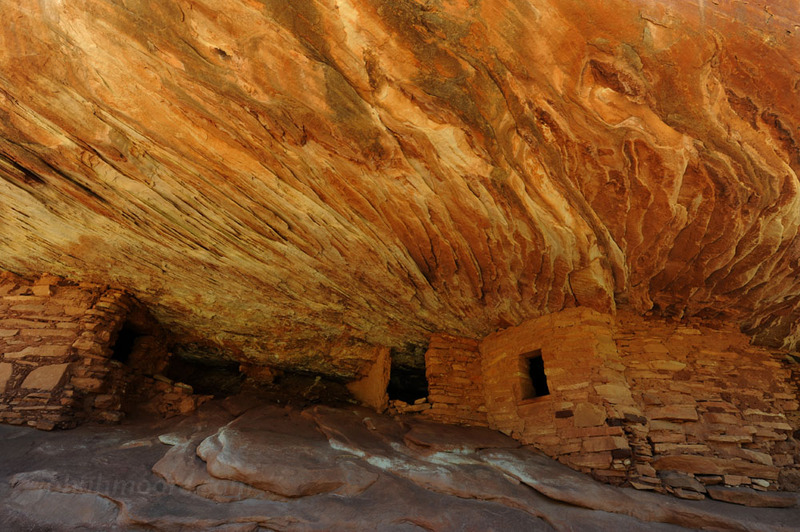 So on my recent and first photographic tour of the Northern Arizona and Southern Utah area, they were on the list to go check out. This trip was more of a familiarization while hitting a bunch of the iconic spots… later I’ll go back and take my time at individual locations. The night before Cedar Mesa found me photographing sunset and the blue hour after sunset at Monument Valley Navajo Tribal Park in Utah. I planned to camp there and get up very early for sunrise photography and to drive the 100 miles to these ruins, but I stayed out too late photographing and then had a really hard time in the dark finding the dirt road to the unimproved campground… and once I did find it, I was not convinced that my Honda Accord would safely get me out the road. 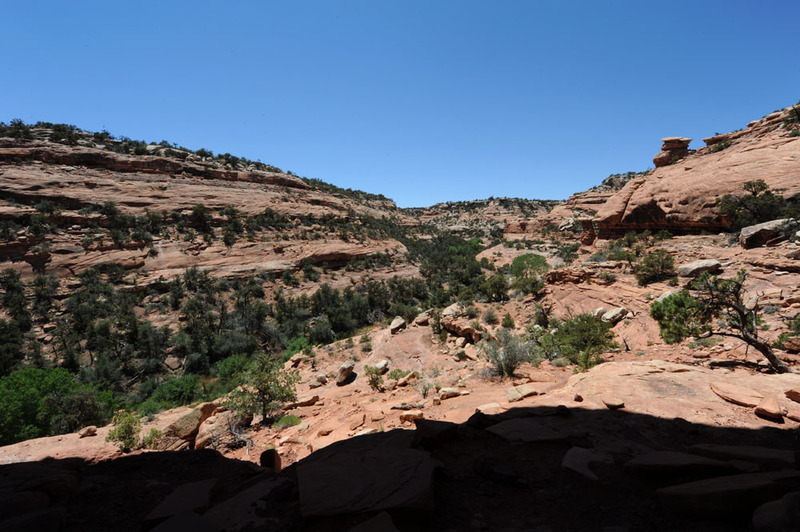 The only local hotel was full, so I hit the road very late up to Cedar Mesa, arriving around midnight and pulling down some random, dark dirt road to grab a few hours of sleep in the back of the car. Bright and early the next morning, after a groggy breakfast at a little joint in Blanding, Utah, (greeter, waitress and cook were all the same woman, who I think owned the place! ), I headed out to find the trailhead for House on Fire. None of these places are marked and the internet has often sparse (or incorrect) directions. Which was true in this case as well… there was no road whatsoever at the designated spot! But some poking around and creative reading of the directions (“maybe 0.3 miles before really means after…”), finally netted me the correct unmarked, unpaved road. I drove right past the trailhead and when I figured out my error and turned around, another person had showed up. Her name was Lynn and she was on a road trip from Minnesota, where she will be retiring later this summer as a school teacher. She’d been out there the day before and had not succeeded in finding the ruins, but had talked with a ranger and was giving it another go today. We got our gear together, found the trailhead, signed the BLM register, and shared the hike up the canyon. It was a pleasant 20-30 minutes up an often-treelined canyon wash. I had succeeded in finding GPS coordinates for the ruin in a reference book in a public library in Arizona the day before, so kept an eye out for whether we were headed in the right direction. As always, even with GPS, we nearly walked past the ruins! As it turned out, we got there hours too early! Everything we’d both read was that it was a mid-morning photo location where the light was right once it hit the floor of the canyon and reflected onto the ruins. It turns out that what really makes the color go off is when the light hits the rock just in front of the ruins. So we explored a bit and hung out for a couple hours. A pair of locals out hiking stopped to chat for a bit, and a pair of German tourists showed up to also photograph. 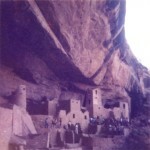 They’d seen me at Monument Valley the day before and had been at my next stop, Fallen Roof House, earlier that morning. 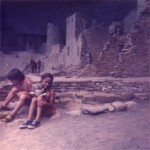 They were very nice and I enjoy company, so I wish we’d talked the day before and had managed to hook up for both ruins! Late, late morning the light finally started going off for House on Fire. 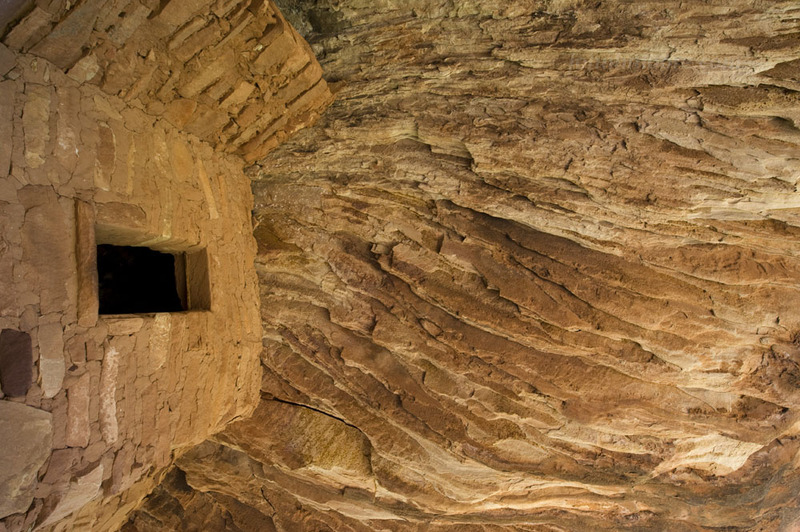 The odd rock striations above the living quarters take on a red hue and look just like fire billowing out of the roof when photographed from the right angle. We got our photos and headed out. Lynn was heading south and the Germans were headed north, so I headed off to Fallen Roof House on my own. 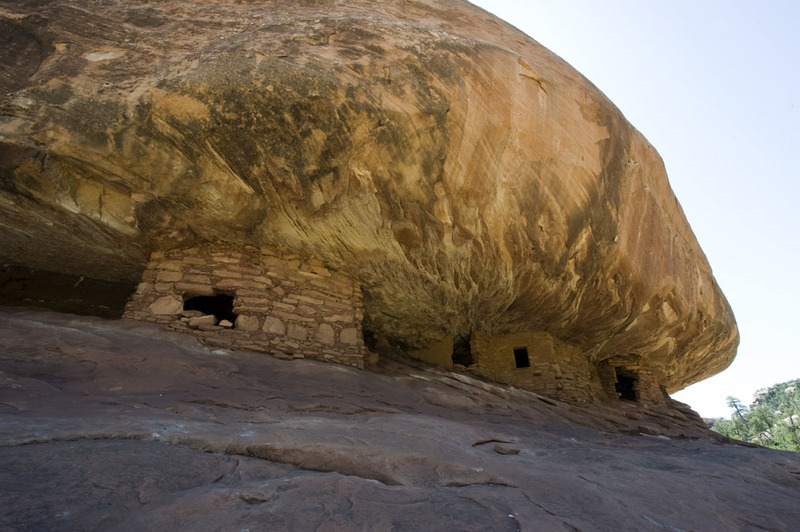 Fallen Roof House is about a half hour away, several miles drive down an unmarked, unpaved dirt road, and then a 30-45 minute hike down into a canyon system. 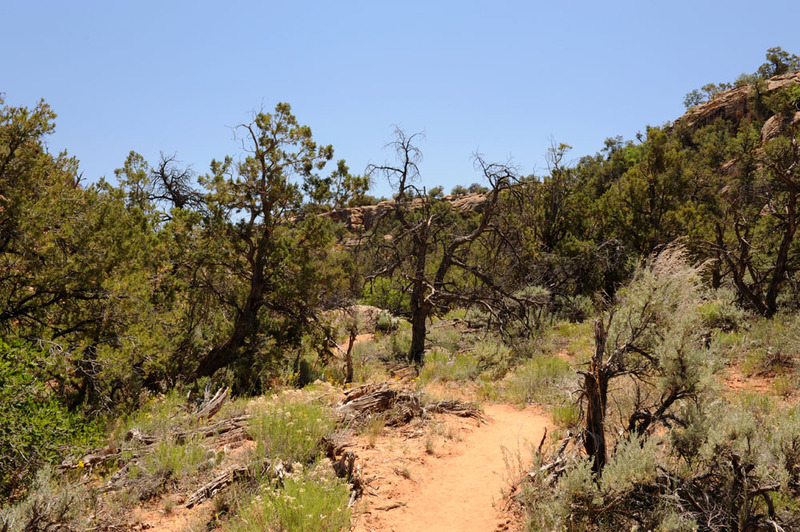 All the directions say that the route can be hard to follow and that you have to make sure that you pick the right trailhead (there are several right next to each other!). Picking the right trailhead turned out to be one of the hardest parts. 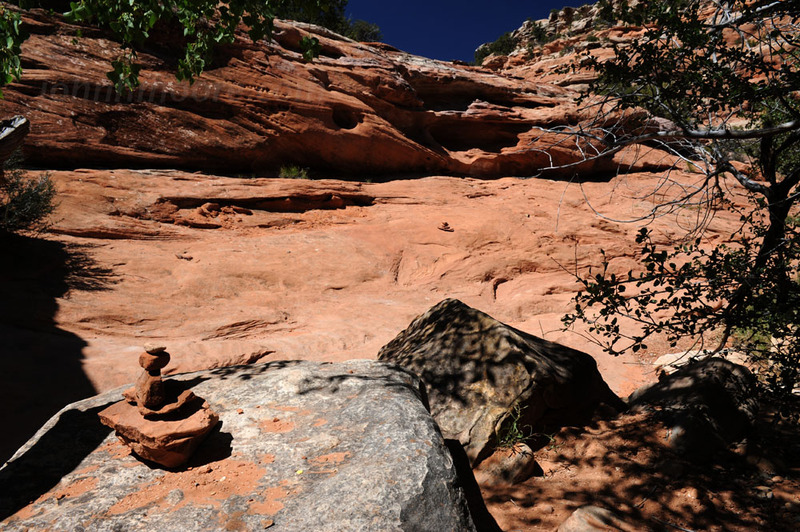 From there, with one notable exception early on the trail, the route was relatively well marked with either visible trail or rock cairns. I was all alone for a couple hours on this hike, mid-afternoon but not too hot. Once again, I walked right past the ruins… but not too far. Unlike House on Fire, these ruins sit perhaps 100-150 feet above the canyon floor. You have to scramble up steep slickstone to get to them. Not dangerous, but you have to plan your route out well. The ruins are gorgeous. The section of collapsed cliff creates the most amazing patterns in the rock. 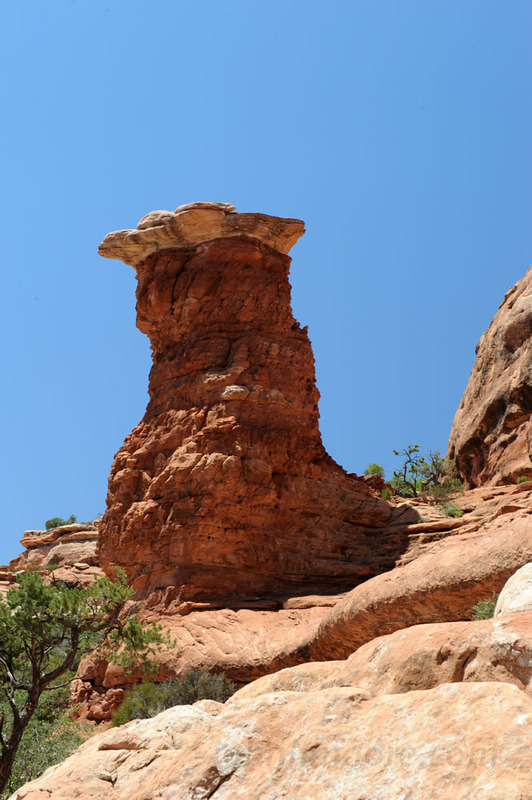 Mostly the rock pieces sit as if they are where they fell in front of the ruins, but three slabs are neatly stacked on top of each other–most likely by a human. This bothered me, so I tried to keep them out of the photos. One description of the ruins mentioned that continuing northeast on the same, high section of the cliff would shortly bring you to another set of ruins, but (a) the cliff didn’t run northeast (!?!?) and (b) explore as I might in both directions, I couldn’t find any nearby ruins. 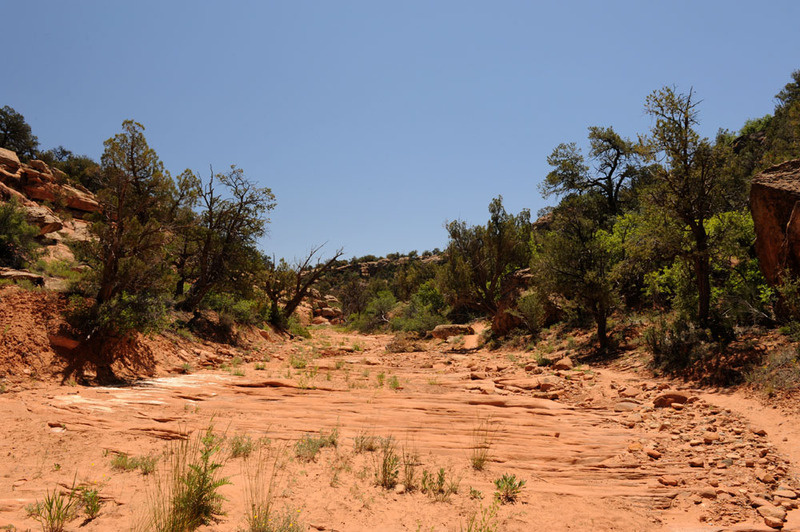 There was one interesting-looking narrow path around a corner of the canyon further down-canyon, but narrow paths 100-150 feet up a cliff while on my own didn’t seen wise, so I didn’t try the path. 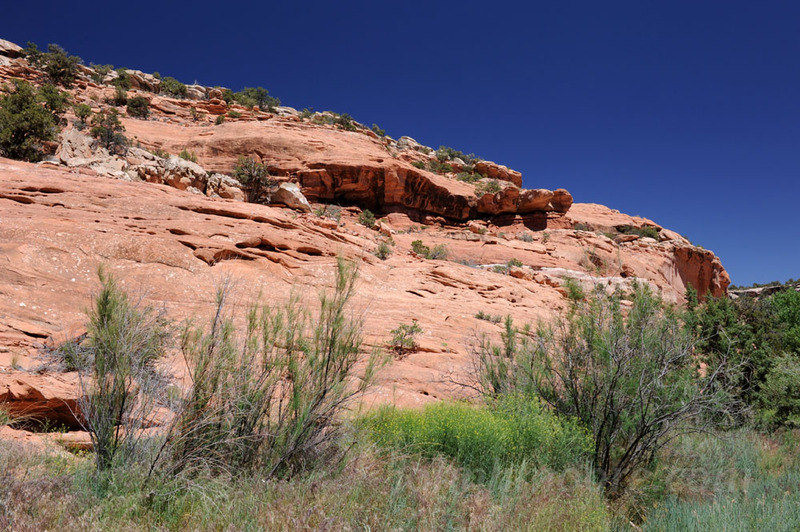 The trail back out was uneventful–so long as you kept a close eye on the rock cairns, and I was shortly back at my car. Both this canyon and the canyon that House on Fire sits in are said to include quite a few ruins, so I hope to go back some day and spend a day or two in each canyon, just exploring. They’re fabulous, untouched reminders of a time long past. This entry was posted on June 15, 2011. It was filed under Ancestors. Would it be possible to get a print of the photo in the right top corner of this set? Can I get a print of the photo in the right uppr corner of this set?